Find out everything you need to know on the new Kia Sportage from independent vehicle review website Car And Driving. You can watch the video review to the left to see more of the car or read their written review below to get a true insight from an expert in the automotive industry. Kia's fourth generation Sportage looks every inch the stylish 4x4 about town, even though most models sold have just the front wheels driven. In 1.6-litre GDi petrol form, it's better value than ever, as Jonathan Crouch discovers. Kia's hugely improved Sportage is stiff competition for both Qashqai-like Crossovers and RAV4-like compact SUVs. Even in entry-level front-driven 1.6-litre GDi form, it's a very complete - and surprisingly desirable - family car. Crossovers - Nissan Qashqai-like family hatches with car-like dynamics and running costs that belie their SUV-like looks and optional 4WD - are big business in Britain these days. From almost nowhere a few years ago, this class of car now accounts for nearly 10% of the UK market - around 130,000 sales a year. Such a lucrative sector is it that today, we have all kinds of models claiming to be 'Crossovers'. Some, like the Qashqai of course and Peugeot's 3008, clearly are more family hatch than 4x4. Others, like Ford's Kuga and Skoda's Yeti, look far more like the kind of model that until a few years ago, we would have classified as a soft-roading compact SUV, slightly more car-like alternatives to a Toyota RAV4 or Honda CR-V but still very much 4x4s. Kia's third generation Sportage is billed as a 'Crossover' but looks - and feels - more like a less politically correct small SUV. Either way, it's a significant car for the Korean brand. The fourth generation version of this car is basically a development of a smart predecessor that transformed Kia's sales in this segment. All that car needed was a smarter interior and a bit more technology, things this redesigned version is well ready to deliver. Most of its buyers will be quite happy with the 2WD models that make up the majority of the range, variants like the most affordable 1.6-litre GDi petrol version we look at here. Ultimately, what this car claims to represent is a design that blends the best features of Qashqai-like Crossovers with RAV4-like soft-roading small SUVs. And if it manages to do that, it'll be a very tempting prospect indeed. Behind the wheel, the feeling is far more RAV4 and Freelander SUV-like than the more ordinary family hatch-like feel of the Nissan Qashqais and Peugeot 3008s that Kia says this car competes against. A lot of buyers will think that a very good thing. It's certainly impressive the way that the designers have managed to combine a commanding driving position with a seat that's easy to slide in and out of. High-sided flanks, a nose invisible from the driver's seat and a small rear window do make this a car that demands a little adjustment if you're trading up from something more conventional, but once you adapt, you should find the Sportage to be an easy thing to live with. Of course, the car isn't intended for those planning a jungle expedition. It'll be equally ineffective if you want to corner Lewis Hamilton-like on your door handles, a pastime far more suited in this sector to cars like Ford's Kuga or Nissan Qashqai. So what exactly does it offer? Well, something that's probably far better suited to the kind of driving that most potential family buyers will actually do: a softer, more relaxed approach that balances body control, handling response and ride comfort aided by hi-tech multi-link rear suspension in a very impressive fashion. If the Koreans could make the variable assistance power steering a little more feelsome, it'd be even better still. The 1.6-litre GDi variant's petrol engine isn't any ball of fire, but rest to 62mph in 11.5s en route to 111mph should be enough for most. The front end of this MK4 model Sportage is the biggest change over the outgoing model, thanks to smarter headlamps that sit just above a bolder, lower, wider version of Kia's hallmark 'tiger-nose' grille. These lights are now positioned higher, sweeping back along the outer edges of the sharply-detailed bonnet. The result is a more imposing appearance and a more stable-looking stance, despite this model retaining the same 1,855mm width as its predecessor. It's 40mm longer though - and more aerodynamic. 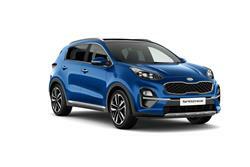 At the rear, this fourth generation Sportage features more horizontal forms and clearly defined feature lines, with smooth bodywork on the tailgate, emphasising the car's width and giving this compact SUV a more stable appearance. Inside, there's a completely new interior, with higher quality materials and a central console that cascades downwards and is tilted 10 degrees towards the driver. The 30mm increase in this model's wheelbase means that the cabin is more spacious too, with greater headroom front and rear. At the back, the seats recline further than before for greater long distance comfort. Out back, bootspace is up from the previous model's 465-litre total to 503-litres here. Sportage 1.6-litre GDi petrol model pricing mostly sits in the £18,000 to £21,000 bracket. The asking figures represent a saving of around £1,800 on the equivalent 1.7-litre CRDi diesel version. Both derivatives like most Crossovers, only come in 2WD form. This fourth generation Sportage is looking to nick sales from the likes of Skoda's Yeti and Suzuki's SX4 S-Cross - and if early data is anything to go by, it can also attract buyers looking at slightly pricier cars like Ford's Kuga, Mazda's CX-5 and even Toyota's RAV4. Equipment levels have been subtly boosted across the range. All versions now have 16-inch alloy wheels and all-round disc brakes, a black diamond-mesh grille with chromed surround, front foglights, LED daytime running lamps, cornering lights and chrome-coated belt-line mouldings. Inside, there's smart black cloth upholstery with a grey headlining, electrically adjustable door mirrors, a leather-trimmed steering wheel and gearshifter, all-round electric windows, air conditioning, a DAB radio, Bluetooth with music streaming, USB and AUX ports and 12-volt power outlets in the front and rear. Driving stuff runs to Trailer Stability Assist, Hill-start Assist, Downhill Brake Control and cruise control with speed limiter. Customers have much higher expectations of both Crossovers and compact soft-roading SUVs these days when it comes to running costs - one reason why every brand in this market (even Land Rover) has had to make available a super-efficient 2WD front-driven model at the foot of its range. All 1.6-litre petrol and 1.7-litre diesel 2WD Sportages are sold under Kia's green-fingered 'EcoDynamics' banner, which means that they feature ISG Intelligent Stop and Go technology that disengages the engine when you're stuck in traffic or waiting at the lights, then restarts it seamlessly. As a result of this, the 1.6-litre GDi petrol variant is able to manage 42.2mpg on the combined cycle with emissions of 156g/km, though those figures are some way off the 61.4mpg and 119g/km readings you get if you go for the 1.7-litre CRDi diesel. Overall, it's hard to fault to much about the Sportage's financial proposition. Residual values are looking very sunny, insurance is reasonable at group 10 for the 1.6, plus there's the seven year/99,000 mile mechanical warranty that attracts so many to the Kia brand. Kia hasn't made a huge step forward with this fourth generation Sportage model, but the improvements are certainly welcome. The rather plasticky cabin of the original version has been replaced with something rather more modern and there's certainly a greater dose of the kind of technology that modern buyers tend to want nowadays. Best of all is this car's value proposition. The fuel and CO2 returns aren't anything to write home about in this 1.6-litre GDi petrol guise but the major drawcard of this entry-level model is its affordable price. Around £18,000 gets you a lot of car. That's the kind of budget that most realistic competitors just can't match.